Actress Mary Ellen Trainor, who starred in films like The Goonies and Lethal Weapon, has died at the age of 62. Trainor was best-known for playing the mother, Irene Walsh, in The Goonies, and police psychiatrist Dr Stephanie Woods in all four Lethal Weapon movies. She was married to director Robert Zemeckis for 20 years and appeared in several of his films including Forrest Gump and Back to the Future Part II. She died last month of complications from pancreatic cancer. Trainor began her Hollywood career as a producer's assistant on movies including Steven Spielberg's 1979 film 1941, which Zemeckis wrote. 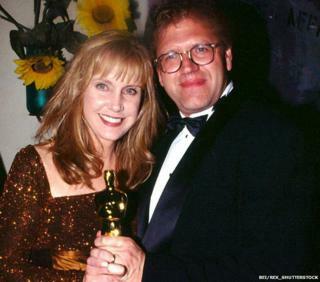 The pair married the following year and Zemeckis cast his wife as the kidnapped sister of Kathleen Turner's character in 1984's Romancing the Stone. She went on to win parts in other classic 1980s movies like Die Hard, Scrooged and Ghostbusters II. On TV, she had regular roles in sitcom Parker Lewis Can't Lose and the dramas Relativity and Roswell. Lucasfilm president Kathleen Kennedy, a lifelong friend, said: "Mare and I have been close since our days together as college roommates, and she even provided the introduction to Steven Spielberg that jumpstarted my career. "She was a great actress, warm friend and generous spirit."